The process of birth is done best in a caring and supportive environment. Midwives believe birth is a natural process that our bodies were designed to do, and provide focused and individualized care better than the hospital model. As midwives, we hold ourselves to a higher standard of care by providing not only the same routine prenatal schedule as physicians, but by giving each client an hour long visit and offering 24/7 phone availability. We center our care on the needs of the mamas and babies we serve, and involve each individual in every decision making process. You can expect to sit in discussion with your midwife who will honor and respect the decisions you make. You will be given information that helps you come to a decision you may not even know is an option. The end of each prenatal session includes a clinical care portion, where the midwife will listen to your baby, palpate your belly, and check that your body is doing well in pregnancy. The practice of Mama Moon Midwifery was formed to open accessibility to midwifery care to all women. We serve all of Milwaukee and southeastern Wisconsin in homebirths, where the midwife comes to the client and is a guest in her home. The homebirth model empowers each woman to lead in her birth and maintain control of her environment. Prenatal visits are held in office, both in Milwaukee and Wales. Your birth plan will be discussed at length during your prenatal visits, and the midwife will ensure that all of your wishes for your birth are followed through. 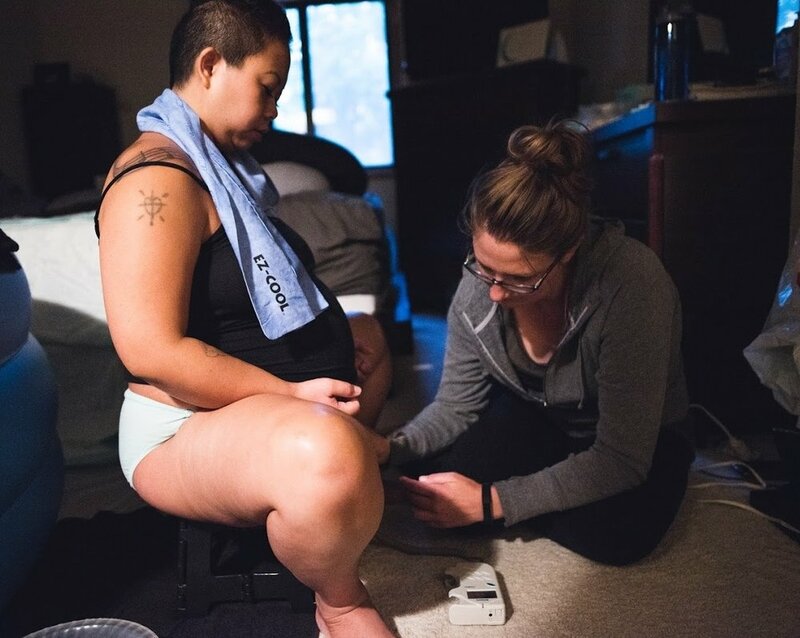 The midwife will work under the “life guard” model, where we observe and assess your labor, but won’t jump in unless requested or we see a need. However, if a woman should need hands on support, midwives count that as a “need” and will be right by your side to offer it. At Mama Moon Midwifery, you will always have two licensed midwives present at your birth. The assistant typically arrives as birth gets closer and is someone you will have an opportunity to meet before your birth so that no strangers are coming in last minute. Your choices will always be honored and respected. Postpartum visits are performed in the home, to keep the mother and new baby from needing to go anywhere in the early days after birth. In the week following the birth of your baby, the midwife will visit you in your home a minimum of 2 times, but often more as needs arise. We ensure that both mama and baby are thriving, and the support systems for the postpartum period are discussed and set up during the prenatal visits. Each person will have unique circumstances in their postpartum. All of these are taken into consideration as we support each client as an individual, and each family as a whole. You will always have access to your midwife postpartum if any concern or question comes up, we are still on call for you after the birth! Included in the newborn care is the option of having newborn screening performed, all are performed in your home and often while you hold your baby. We offer breastfeeding support, and will help you navigate breastfeeding in the weeks following the birth of your baby. We believe women should be given the time to recover, and approach the postpartum period with patience and reassurance.